Usually, such drop in prices will NOT HAPPEN - Unless the company is a fraud case like Satyam, in which case it is possible. But otherwise, in liquid scrips, this is very, very rare event. Usually when you are seeing a sharp drop in price, it is because of many reasons. E.g the company may issue bonus shares, of say 1:1. What has happened in only an adjustment, where a shareholder is given say 500 shares for 500 shares held. Hence, if the scrip may be trading at 300, the fair value after bonus, the same may be valued around 150 - a 50% drop to reflect the increase in no. of shares. Another reason could be the company changes the 'face value of the share' At the time of issue, the shares may have a face value of 100, 10, etc. Now to increase the liquidity, the company may decide to change the face value from 100 to 10, or from 10 to 1, if this happens, a shareholder having 100 shares of 100, will now have 1,000 shares of 10 or a shareholder having 100 shares of 10, will now have 1,000 shares of 1. Nothing has happened to the company's valuation, but the change in face value will correspondingly decrease the market value of the shares. And finally, there is a case of rights issue. Say the market price of a share is Rs. 80, and the company proposes to issue rights shares at a certain ratio - e.g 1:2 at a discount of Rs. 40 to the market price. 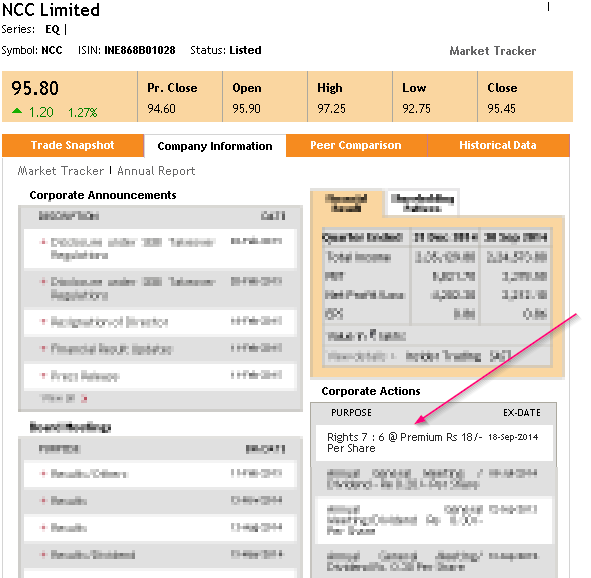 All shareholders of the company will be eligible to such rights issue till a certain date. So when the script becomes ex-date, the valuation of the company will change to reflect the increase in shares and share premium, and the market price will be reflected accordingly. You can find more details on investopedia. Can anyone tell me why in some company have a sudden drop of price [40% to 500%] in a single day . My question is this if somebody had shares on that company on delivery then he will be totally pissed off. How to know this before it happens? IPO.For INDEX stocks there is no limit on ceiling.It is mostly news driven. What exactly u want to say by this attachment ? that there was a rights issue on the stock and hence the price drop. who introduced circuit circuit breaker in India? SEBI or exchange? Is nf will hit lower circuit after election result?